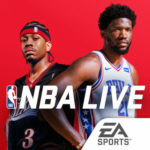 We’re now more than a month into the current 2018-19 NBA season, and if you’re keeping busy on the gaming front as well, you’ve probably been playing EA Sports’ NBA Live Mobile on your iPhone or Android device for quite some time. As EA Sports describes it in the game’s official description, this game serves as your chance to build the “ultimate roster” of NBA stars from the past and present, may it be modern-day standouts like Joel Embiid or legends such as Allen Iverson. This title comes with various game modes where you can play 5-on-5 games against AI and human opponents alike, or unlock new players and other rewards by completing the game’s stock Campaigns and special events. EA Sports calls this the “world’s most downloaded” basketball game for mobile devices, and we can’t really argue with that. 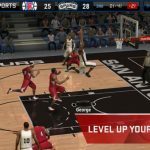 It’s been quite a while since we published our NBA Live Mobile beginner’s guide, where we discussed some of the basic elements and helped you survive your first few days playing it. 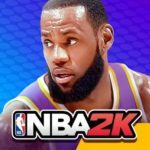 But we’re not quite done covering this title, which is why we’re back with this new NBA Live Mobile strategy guide, where we cover a number of intermediate tips, with a particular focus on the coaching and bench aspects of the game, which you were probably wondering about, as well as the tougher gameplay you may have noticed in recent updates. So let’s not waste any of your time and instead let’s move on to our NBA Live Mobile cheats, tips and tricks in a complete strategy guide! 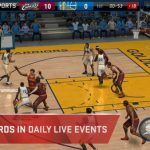 If you thought it was easy to score back when we last covered NBA Live Mobile, then think again. Since we published our beginner’s guide, the game has gotten a few updates here and there, and what we’ve noticed is that the AI plays more physical defense than it did in the past. No longer can you bully your way to the paint without any consequences — trying to do might result in a charging call. Gone as well are the days of kicking it out to anyone in your team who can shoot three-pointers and getting easy buckets from downtown — the game’s algorithms have changed in such a way that tight defense has a more pronounced effect on your chances of converting the shot. Even those short jumpers haven’t been spared; if the defense is tight, then don’t expect your chances of scoring to go above 30 percent. No longer is it enough to time your shots and watch the slider to make sure you get a 20 percent field goal percentage boost or more; even that won’t save you from the effects of the game’s smarter defense. Yes, we know it’s not the best thing in the world to get that high-octane offense nerfed, but as the expression goes, it’s the breaks of the game. That, at least, allows for a more realistic gameplay experience, given the traditionally high level of play in the NBA. See that tab underneath Campaigns on the main menu? That’s the Daily Beats section, which, we’d say, is a great way for you to earn new players and improve your lineup. For example, the Legends events give you a chance to unlock some of the finest players from the NBA’s past — at the time of this writing, these include the likes of James Worthy, David Robinson, and Jerry Stackhouse. Winning the first challenge in the Legends events will typically get you a player card as a reward for your first successful challenge, though you could also win tokens, which you can collect in order to unlock highly-rated players with overall ratings in the late 80s and 90s, such as in the Impact events. Other events could give you a chance to earn all sorts of NBA Live Mobile resources, including, but not limited to coins, stamina, and even more player cards! It is also recommended that you try to go as far as you could in the Daily Beats events. After winning a player card as your initial reward, you will win resources which you can then use to improve that player’s rating, thereby giving you a stronger lineup that you can ride all the way to promotion in Showdown mode! 3. Why Is Season Mode Important? Some challenges, including many of the ones that are included in NBA Live Mobile’s Black Friday specials, allow you to take control of a team that’s protecting a lead over the last two minutes (or last minute-and-a-half) of a game. Now it may sound pretty simple — just hold on to the ball and kill the clock, taking a shot with only a few seconds remaining before the shot clock expires. However, the fact that you’ll typically be facing five-man lineups with a higher overall rating than yours means that five-point lead you’re holding with 80 seconds left might evaporate before final buzzer sounds! Especially with the recent nerfs we described above, it won’t be easy to get a good shot off against the opposition, but if we are to give you some advice on how to survive these challenges, we suggest doing just as we said above — hold on to the ball until the dying seconds of the shot clock, but make sure you’re taking a good, preferably unguarded shot and getting the ball in the right person’s hands. Additionally, the last thing you want is to throw those wild baseball passes in challenges such as this. Keep things safe and simple when passing the ball, but don’t hold on too long to the ball, because the defensive improvements make it more likely for opponents to rip the ball off of your hands if you hang on to it for too long. 5. About Coaches – What Can They Do For Your Team? You’re probably wondering what’s in it for you when it comes to the coaching mechanic in NBA Live Mobile. You can get new coach cards by completing certain challenges in campaigns and events, but what’s the deal, for example, if you’ve got a Defensive coach like Scott Brooks (’10), an Offensive coach like Lloyd Pierce, or a Balanced coach? Just like in Madden NFL Mobile, coaches are there to provide buffs for your team depending on their coaching style. For example, having the aforementioned Scott Brooks (’10) as your head coach will often give you a skill boost of 2 points in Shot Blocking if you have at least one player that matches his Defensive style, and a skill boost of 4 points if you have five matching players. Lloyd Pierce, on the other hand, often gives you a Dunking boost of 1 point if you have one to four matching players, and a Dunking boost of 2 points if you have five. Balanced coaches improve passing accuracy, again with lower boosts for one to four matching players and higher ones if all five starters match. These boosts may vary depending on another factor, which we’ll be discussing in the very next tip, and you may also see different stats/resources boosted depending on the coach. Looking at the icon on the lower left corner of each player card will show you what a specific player’s style is — is he Offensive (blue), Defensive (yellow), or Balanced (green). 6. How Does The Bench Work In NBA Live Mobile? They call it a bench, but that doesn’t mean you can actually sub players in and out when playing NBA Live Mobile. Again, this is a game that distills the NBA Live experience into one that’s tailor-made for the mobile gamer, and that means you really won’t have to substitute anyone if one of your starters gets tired. (These aren’t full 48-minute games, after all!) So how does the bench mechanic work anyway in this game? Just as we hinted above, the bench is what influences the Skill Boosts your coaches can provide to your players, and the better your bench’s average rating is, the greater the effect on the Skill Boosts. Let’s take a look once again at Scott Brooks (’10), whom you may have unlocked as part of the James Harden campaign. If you have an average rating of 65 for your bench, the Skill Boost gets improved by 2 percent. This goes on in increments of five rating points and one percentage point until 80 or more, where you can get an additional boost of 5 percent. It’s actually quite simple, and it could give you solace if you’re concerned that someone with a comparatively high rating is riding your bench instead of starting. While we mentioned the main benefit of the coaching mechanic a few tips ago, a further look at the Coaching Style section will show you that different coaches, just like in real life, have their own playing styles. For example, Nate McMillan (the current Pacers coach) provides a Skill Boost for Dunking and a Reward Boost for coins, as opposed to XP or Reputation, for instance, for other coaches. You’ll also notice that he prefers the 5 Out Spread formation, an uptempo offensive pace, man-to-man defense, and loose defensive pressure. For those areas, it all boils down to personal preference; generally, you may prefer Offensive coaches if you’re an advocate of fastbreak basketball, or Defensive coaches if you prefer a more deliberate playing style that focuses on limiting the other team’s scoring, as opposed to running up the scoreboard on your end. There you have it! This concludes our NBA Live Mobile strategy guide. We hope you’ve enjoyed this one! And if you know additional tips or tricks for this basketball game, let us know below in the comment area!